Generosity campaign 40acts which challenges people to do a different act of generosity each day for Lent, will be launching on 18 February 2015. The multi-award winning campaign from Christian charity Stewardship already has nearly 40,000 people signed up to take the challenge and close to 1000 churches taking part. During the lead up to Easter, the campaign invites people to do Lent differently, so that instead of just giving something up, participants are encouraged to give something out to those around them. Last year the Christian campaign caused a wave of over 1.8million acts of generosity, as Christians both in the UK and worldwide chose to demonstrate God’s love and generosity through daily choosing to live generously. Through simple acts like saying thank you, talking to strangers, sharing a skill, forgiving people and sending anonymous gifts the campaign hopes to make living generously a daily habit for Christians. Last year Stewardship received thousands of inspirational stories on how the campaign had impacted participants. Many felt it had helped them to be bolder in sharing their faith, and were delighted to see how well their actions were received by their neighbours and the broader community. “Lent marks a pivotal point in the history of the Church, when Jesus prepared to give himself up as a sacrifice for all mankind. Although traditionally Lent is about giving something up, over the last four years we have seen a growing number of people embrace a new idea: that we can reflect God’s incredible generosity on the cross by creating a daily habit of generosity throughout Lent”. This is the second year that 40acts are also encouraging families, schools, small groups and churches to take part in the challenge as well as individuals. It is also the first year 40acts are providing separate resources for students, which the introduction of 40acts for Students, with Word 4 U 2Day. 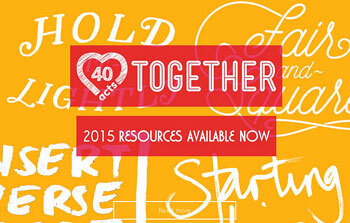 The campaign has a separate section called ‘40acts Together’ which provides resources like downloadable studies, sermon notes, prayer guides, event planners and kids wall charts. Participants are sent a daily challenge along with a biblical reflection from 40 highly regarded contributors. This year each email will have three different versions of the challenge in order to make the generous acts accessible to everyone irrespective of financial or time limitations. Individual participants can sign up to 40acts via 40acts.org.uk and will receive emails from 18 February until 4 April 2015. They can also see the daily challenges on the website and social media sites. Families, schools, students, small groups and churches can sign up in the 40acts Together section of www.40acts.org.uk. They will be emailed instructions on how to download resources and will receive a weekly email throughout Lent to help them stay on track. Those contributing to this year’s 40acts campaign include: Canon Ann Easter (Chaplain to the Queen), Bear Grylls, Brad Formsma (iLikeGiving), Scott Harrison (Charity:Water), Dot Tyler (Tearfund), Guvna B (rap artist), Jackie Elton (Christian Connection), Jonty Langley (Huffington Post), Rev Tony Miles (Methodist Central Hall), Ram Gidoomal (Fairtrade) and many more. Visit www.40acts.org.uk for more information about the campaign and to get involved.